As an Orange Mud Ambassador, I get the opportunity to see their new products before they get to market. As such, I had already seen some pictures of the new (and first) handheld from Orange Mud. However, I was fortunate enough to get to play with it first hand while working with the team at Outdoor Retailer Summer 2014 last week. I have always been a bottle guy, and while I now use a vest almost exclusively, I started with handhelds. I transitioned to vests purely out of the need to have extra storage and water for many of my unsupported, back country training runs. With the HydraQuiver single barrel, I also find that I use it on shorter runs too. That being said, there are MANY people that love handhelds and, I have to admit, there are times when they really are the simplest hydration solution. I do have a number of issues with a lot of the handhelds that I have used in the past. The elastic that you find on many brands that wraps around the bottle loses its elasticity over time. The bottle moves too much, requiring me to maintain a constant grip on it. In typical problem-solving fashion, Orange Mud set out to solve both of these with their entry into the handheld market. Take a look at a couple pictures and you will quickly see why. In this picture, you will see that the bottle sits down in a full enclosure instead of elastic bands wrapped around the bottle. This material is built to last and will not break down over time. It is also made of the same high-grade material as the HydraQuiver packs. The enclosure will come with a 21 oz. bottle, but easily accommodates the larger 24 oz. bottles that come with the packs. It also has two pouches on the front. One smaller secure pouch (with a key clip inside it) and a larger pouch behind it, great for gels and such. In this picture, you get a view of the strap that holds the bottle around your hand. This strap is fully adjustable, allowing you to decide how snug you want it to fit. 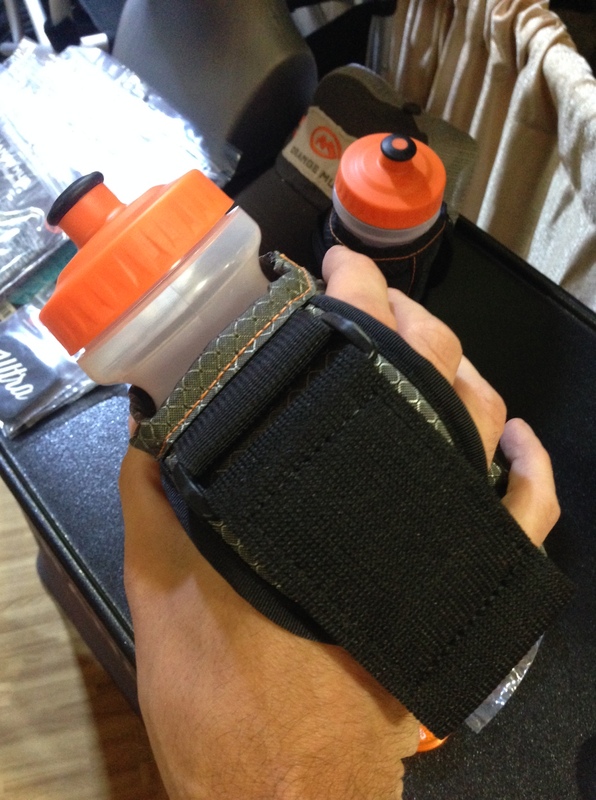 The wide of the strap also maximizes coverage over your hand, which aids in keeping the bottle in place. Once adjusted for your hand, the bottle simply does not move. While I was not able to take it out for a proper run (had to save it for demoing at Outdoor Retailer), I did wear it around for the good part of the day at the show and was happy with both its comfort and stability in my hand. I will make the necessary updates to this review once I get a chance to field test it. Overall, it promises to be another positive innovation in the world of endurance hydration. It is due out toward the end of the summer. This entry was posted in Product Spotlight, Sneak Peek and tagged hydration, Orange Mud, running, trail running, ultra running, ultrarunning by Ultrarunner Joe. Bookmark the permalink. Thanks for the review – how would you compare this handheld to other brands? Any major differences? The biggest difference from what I can tell is how snug and secure it fits in your hand. Most other handhelds I have tried still move a bit, even if you tighten them a lot. Others also loosen gradually over the run and permanently over time. I haven’t had a chance to field test it yet, but just based on the design principle of this handheld, I don’t see that occurring. These are built to last for sure! I have been using handhelds for years and I am the proud owner of an advanced release of this wonderful handheld. I got to use one of the prototypes in the development process and have been amazed again at how Orange Mud have dealt with every issue raised concerning the prototype. 1) Comfort – beats anything previously by a long way. The lip of fabric covering the hand and protecting it from the strap is perfect. 2) Stability – You don’t even have to hold the bottle – it just becomes an extension of your body. and yet it does so without being too tight or uncomfortable (see above). There is zero movement of the bottle within the handheld itself – I am told this is due to the reinforced nylon meshing, but all I know is it works superbly. I have used UltraAspire and Camelback handhelds in the past. Once this is officially released I will get a few more and throw out the old ones. No other handheld comes close. is the bottle easily interchangeable? Yup, just slides in and cinched around the bottle. I have only tried a couple othe bottle brands though. 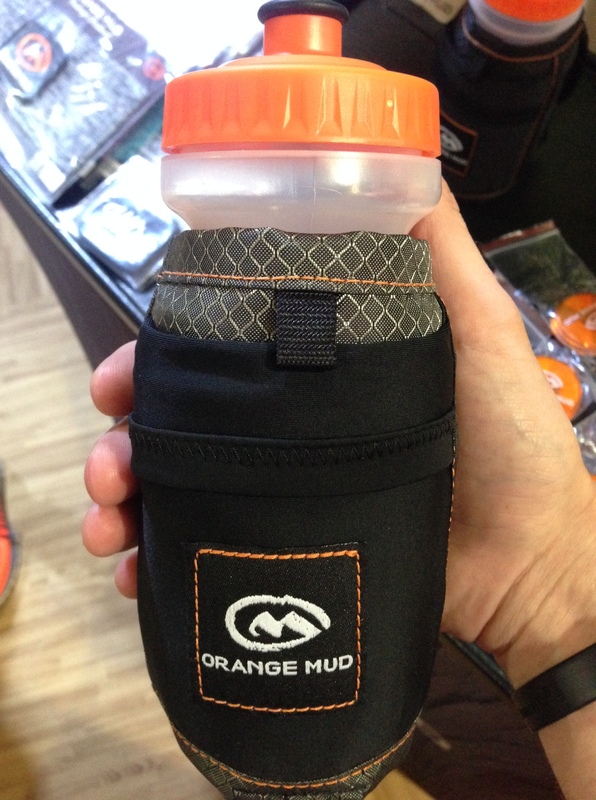 Orange Mud uses Specialized bottles, so they are a fairly common form factor.